Ferdinand Ries and his family settled in Godesberg in the summer of 1824. This elegant town, developed by the last Electoral Prince as a spa and bathing resort, was one of the most attractive travel destinations in Europe, not least on account of its romantic location on a wide stretch of the River Rhine and the view across the river of the Siebengebirge Mountains with their many mediaeval castles. Indeed, Godesberg had become a regular “must” for young and wealthy English gentlemen on their Grand Tours. Ferdinand and his wife acquired the house that had been built by his father. Still standing today, it was one of the so-called “White Houses” that stood next to the “Redoute” – a ballroom and concert hall where, during the reign of the Electoral Prince and under the directorship of Franz Ries, concerts of the court orchestra had been performed every Tuesday. It was here, in 1792, that the first meeting between Haydn and the young Ludwig van Beethoven had taken place. Ries had been welcomed home by his fellow Rhinelanders as a musical celebrity. In 1825 he was appointed director of the Lower Rhenish Music Festival, which in that year took place in Aix-la-Chapelle (Aachen). Ries made this the occasion for the first ever performance of Beethoven’s 9th Symphony in (Prussian) Germany. The Lower Rhenish Music Festival was an early institution of bourgeois culture that alternated each year between Aix-la-Chapelle, Cologne and Düsseldorf. Its participants were primarily “amateur” – i.e. not professional – musicians. Ries directed the festival eight times all told. 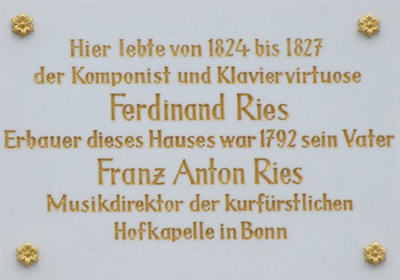 As a composer, Ries now re-devoted himself to a genre that he had cultivated considerably during his youth in Bonn and his formative years in Vienna but had somewhat neglected in London, namely the string quartet. During the three years he spent in Godesberg, from 1824 until 1827, he composed no fewer than five works of this quintessential genre of chamber music. The exciting Rhenish landscape also inspired his Concerto No. 8 for piano and orchestra, which he subtitled “Gruss an den Rhein” (“Greetings to the Rhine”). In 1827 Ferdinand Ries turned his back on the Rhineland spa of Godesberg, which despite all its beauty had turned out to be much too tranquil for an ambitious musician, and settled with his family in the large commercial city of Frankfurt am Main.